The Wayuu are natives of northern Columbia and northwestern Venezuela, inhabiting much of the coast of the Guajira Peninsula. They still speak their native language, and have little contact with the Spanish-speaking outside world. Upon reaching puberty, Wayuu girls enter into a period of seclusion which could last up to two years. During this time, the elder women of the clan teach of the responsibilities of motherhood and being a wife – primarily cooking and crocheting. At the end of this period, the girl has a “coming out” party of sorts, in which she performs native dances with any man who might have an interest in her. Nearly all marriages are arranged, and accompanied by a dowry, which is given to the young woman’s brothers and uncles. Columbian actress Natalia Reyes plays young Zaida, and the suitor who intends to marry her is Rapayet, played by newcomer Jose Acosta. Wary of Rapayet’s family and of his intentions, Zaida’s stern and uncompromising mother Ursula (Carmina Martinez) demands a dowry assumed to be well beyond the young man’s means. Upon his fulfillment of her requirements, Zaida is betrothed to Rapayet and they begin a life together. Now, how exactly does Rapayet produce the outlandish dowry? Ahh, there lies the crux of “Birds of Passage” – an homage to the drug culture that has destroyed the native customs of the Wayuu, and often pitted entire clans against one another in ways deemed unimaginable as recently as a half-century ago. Rapayet’s Spanish friend Moises (Jhon Narvaez) hears of some Peace Corps hippies who are interested in purchasing some Columbian marijuana. He knows a source up in the mountains, and soon the two friends are bringing in wads of cash. 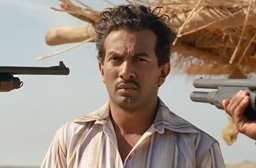 But then the cocky and careless Moises kills two white drug runners he accuses of buying from their competition, and Rapayet is forced to choose between his traditional Wayuu lifestyle and that of the outside world. It’s not as easy a choice as we might imagine. On the one hand, leaving the tight-knit clan means he loses his wife and family. On the other hand, the laws of supply and demand have provided him a very comfortable living. Can he take Zaida and his children away from the grip of the Wayuu? Does he even want to? “Birds of Passage” introduces us to a people most of us have never even heard of. Then Gallego and Guerra show us how our insatiable appetite for drugs has destroyed their culture. We all felt a certain amount of guilt upon viewing Mel Gibson’s “Passion of the Christ.” Wait ‘til you see this one. Even if you’ve never smoked a joint, “Birds of Passage” does not paint a pretty picture of the white man’s influence over a tightly-knit native culture. And the Spanish are seen as nothing more than opportunists – willing to exploit the native crops of the region for financial gain at the expense of any traditional values that might stand in their way. Toward the end of “Birds of Passage,” a Wayuu clan elder laments that her people have outlasted pirates, the Spanish, the English, and a host of Columbian governments intent on destroying their traditions in the name of segregation. But this new threat – the money associated with the international drug trade – is the one outside hurdle the Wayuu have been unable to clear. “Birds of Passage” is a fascinating study of a culture we helped destroy – and by “we,” I mean any of us who is not Wayuu. As a film, it is mildly reminiscent of “Hotel Rwanda,” in that we’re introduced to people most of us never knew or cared about, and then we witness the unraveling of their culture and lifestyle. And much as in “Hotel Rwanda,” the severity of the murders is accentuated by the way we witness them – from a distance, and typically from the point of view of the murderer. Thanks to Hollywood, we’re numb to watching bodies blown away by gunfire. Here we see the anguish on the faces of those committing the acts of murder; we see bodies lined up along the roadways; we are immersed in the by-product of the drug wars without being subjected to actually viewing up-close re-enactments of the murders themselves. And the effect is chilling. Unfortunately, not enough Americans will care to see “Birds of Passage.” We’d rather escape from the travails of our daily lives with the latest superhero blockbuster. We don’t care enough about native tribes to give two hours of our time to learning about how our appetite for drugs has impacted their culture. And that’s almost as disheartening as the subject matter of “Birds of Paradise” in the first place.